I love these pictures. I actually didn’t put them together and spread them out between walls. The gold in the picture really shines and adds character to the pictures. 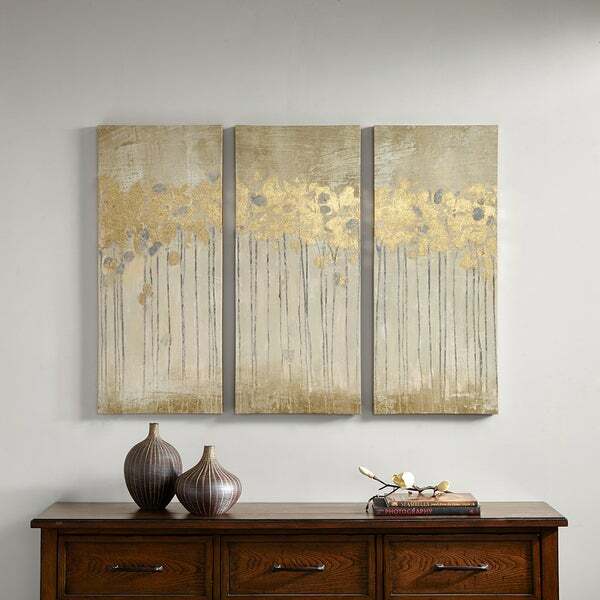 Decorate your walls with this Copper Grove gel coat canvas. The set incorporates a beautiful sandy hues with hand applied gold foiling for added dimension. This set is beautiful. They're heavy duty and have nice color/texture. The gold isn't too bright or harsh. 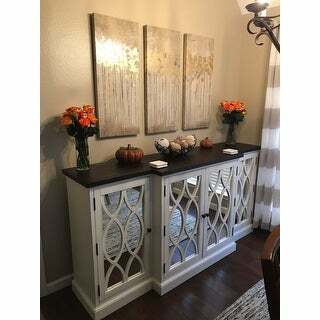 They were large enough to fill a big space in my home and look perfect. Make sure you measure, these were a little bigger than what I imagined. This worked for me, but just a heads up. But the beauty and shine of the pictures really make it pop and worth the imperfections. Wood/hanging brackets do not line up well so a tape measure is not very useful when hanging. Really elegant looking! Nice set if you get 3 different Prints! This would have been a nice set except it shipped with two of the pieces the same print. To add to the frustration, on one of the prints the wall hangers were not put on evenly so when we went to hang the picture it did not hang evenly. If you can get a set that is sent with everything correct I would have given this 5 stars. Because of the size and bulk of this set returning it would be a major hassle and expense. This set was exactly what I was looking for to put on a large living room wall. The description stated sandy hues, which is what I needed. It has more greenish undertones. I was hoping for more tan. When our lamplight hits the gold from across the room, though, it is very beautiful. Very nice set. Would recommend it if you want taupe and gold accents. 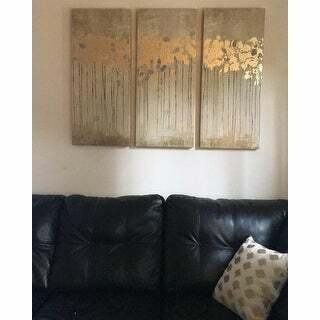 I love love this gold three piece canvas. This will make any empty space pop with elegance. I highly recommend for any homes. 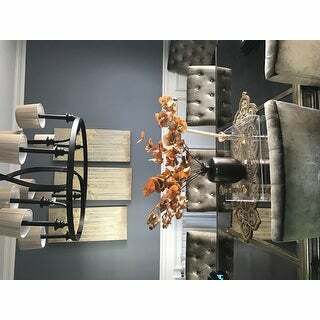 I bought this canvas set looking for a statement piece for the dining room and they are exactly what I was looking for. Great, authentic texture and shine. Would purchase again. The item was exactly as pictured and the gold foil gives it a nice bit of interest. The only reason that I didn't give it five stars was that the 'canvas' looks and feels more like vinyl than canvas and there was a small area where the paint was chipped off. The panels are heavier than anticipated but are still easily for one person to hang. I don't much go for abstract art, but I really like this piece. 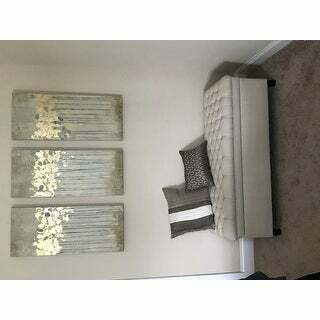 I installed over a tufted bench (also from Overstock). I think it makes the look complete. I am very happy with this purchase. The pictures look just as they do online. The canvases have a good weight to them. Only complaint is that the hooks are not aligned to the same measurement on all three pictures. Be sure to measure each before hanging. Other than that, I really like the canvases! If possible, I would return these 3 pieces. Horrible to try to hang and not at all what I expected. They do not line up evenly without much horrible work! I am also unhappy with the quality of the canvas. The colors are nice, but too much blue. Not at all what I expected. I really like the pictures, the back ground does have a greenish tint to it. Does not go the best on my taupe color wall but I will keep them. They go great with the rest of the furnishings. I have a very tall mantle in my master bedroom and these are resting on it with LED candles on glass candle sticks beside them. It is so beautiful, I never get tired of looking at them! 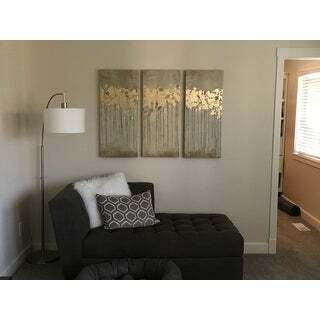 The gold metallic accents are really "gold" looking, not brassy or cheap. You won't be disappointed with these. This trio is very lovely and of very nice quality, especially for the price! The background color is a neutral with a bit of a green tinge, so be aware of that. The gold leafing adds to the overall design and these look very high end. It's a bit darker than pictured in the product listing, but still beautiful. It looks lovely in my living room. I was easily able to hang the panels with Command Canvas Hangers (2 large hangers per panel). These are lovely and well worth the price. "What color are they? I am looking for beige/tan/taupe/gold colors. One review said these pictures have a lot of green color, another said they were more blue than anything! Please advise as to the "true" colors as I would HATE to be disappointed when they arrive at my home and they are on the green/blue color spectrum." "I see where the colors listed are sandy taupe and gold. There appears to be a background color or grey or muted black. Can you tell me what it actually is, please?" "is each individual panel 35 in tall and 15 inches wide?" "Please notify me when this is instock. *"
We do apologize, we are not aware of a restock date at this time. Please enter your email address into the restock alert. We will happily send an email once it is available again.